The Great Northern Railway launched the Oriental Limited between St. Paul and Seattle on December 5, 1905, replacing the Great Northern Flyer. 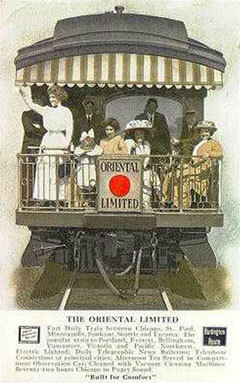 The Oriental Limited designation reflected the Asiatic commerce which had been one of J.J. Hill's motivating objectives in building the railroad itself. 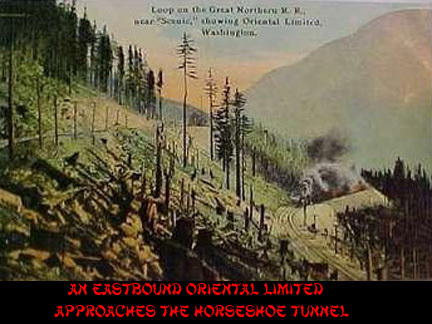 The Great Northern's crack transcontinental bore this name between 1905 and 1929. Significant changes were made to the Oriental Limited in 1909, and again in 1922 after the USRA era. On May 31, 1924, an improved Pullman built New Oriental Limited was placed in service. In the 1890's Seattle began building better port facilities for handling maritime trade with the Far East. In 1896, GN became the first U.S. railroad to serve the Orient through an agreement with Nippon Yushen Kaisha, a Japanese steamship line. Possessing the shortest route from Puget Sound to St. Paul, Great Northern’s traffic flourished as trade with the Oriental grew. 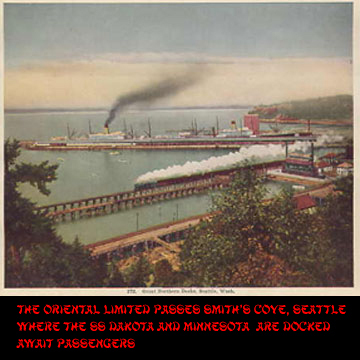 In 1903, the railway completed its own dock at Smith's Cove, at the northern end of Seattle’s Elliott Bay. In 1905, the Great Northern steamships MINNESOTA and DAKOTA were placed in service between Seattle and the Far East. It was now possible to travel on Great Northern equipment from St Paul to the distant ports of the Orient. December 5, 1905, the Oriental Limited was launched as Great Northern's flagship. Its 58 hour schedule over the 1,829 miles between the Twin Cities and Puget Sound won the crown as the swiftest train, four and one half hours faster than its closest rival, the North Coast Limited. 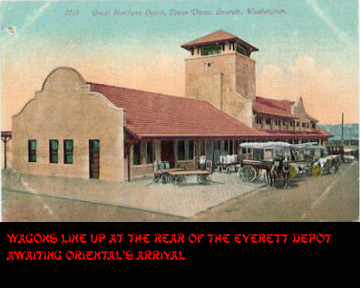 The Oriental Limited was a name which emphasized that the transportation service offered by Great Northern did not end at port of Seattle and fulfilled Hill's dream of direct rail-water connections between the Middle West and the ports of the Far East. Mr. Hill anticipated creating a greater market for American exports, such as steel, wheat and cotton, while establishing Great Northern in the lucrative import trade of silk and tea from the Orient. On November 19, the Great Northern Railway will start a new and addition l train between St. Paul and Puget Sound Points. This will be known as the Oriental Limited and will have new car equipment throughout, consisting of large day coaches, tourist sleepers, palace sleeping cars, dining cars and compartment observation cars. Each car will be of the very latest design in its class and contain all the latest refinements in decoration and arrangement. The observation buffet library compartment cars will be the first of their kind to be used in transcontinental traffic and have been given particular attention. The rear half of these cars is devoted to the observation room, handsomely furnished with easy chairs, writing desks, etc. Wide plate glass windows afford an unobstructed view of the surrounding country..... A well stocked buffet and a branch of the Booklovers library and current periodicals will also be found in this car. The dining car equipment and service has also been given much attention. All service will be ala carte. Other advertisements, announcing the train, referred to it as the ’perfect train’ lighted by acetylene gas. Although the glowing notices went on to state that the trains had new equipment while being careful not to say all new equipment. 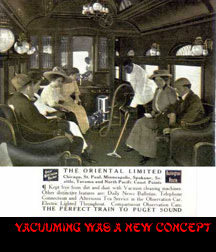 In fact, the Oriental Limited which steamed forth in December 1905 was a mix of new and old equipment. During 1905, Great Northern acquired new coaches, diners and observations in anticipation of the new train. It was not until 1906 and 1907 that builders Barney and Smith and Pullman were able to deliver new smoking cars, tourist and first class sleepers. Once assembled, the appearance new equipment presented a striking departure from the traditional Great Northern varnish. The glossy grooved sheathing sported graceful arched windows, capped with colorful art glass. The highly polished passenger cars were painted a deep olive green, and the roofs, underbodies and trucks were painted a darker olive shade. On the letterboard the words “Great Northern” were proudly painted in goldleaf and outlined in black as was all the external lettering. Characters on the letter board were six inches tall while the car names, centered on the sides below the windows, were four and one half inches high. The first letter of each word of the car name was slightly bigger than the rest. The new observation platform provided a festive ending to the train with its scalloped, red and white striped canopy awning, glistening brass railing, and colorful drumhead. 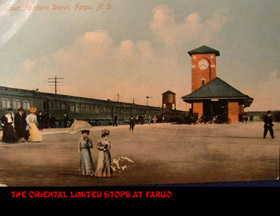 The rectangular sign consisted of a large bright red circle on a field of white with the words 'Oriental' above, and 'Limited' below, both in a black, oriental style of letters. The appearance was similar to a Japanese flag, further emphasizing its connection to the Orient. The Oriental Limited’s interiors were equally stunning and beautiful. The decor was on the cusp of car building design, moving way from ornate inlaid carving to the less elaborate mission style, that was to become the standard decor of first class railroads for the next 20 years. Elegance, style and craftsmanship were continued in the new decor. The dining cars, first class sleepers and observations were fitted in rich mahogany, coco, tonkin, and vermillion. The smokers, coaches and tourist sleepers were paneled in birch and mahogany woods. Colorful art glass crowned the upper sash of the body arch windows, the clerestory transoms and in the lavatory windows of the passenger cars in the consist. Pullman’s glass craftsmen used opalescent glass cut into various designs and pieced together with brass channel, similar to the way stained glass lamps and windows are fabricated today. Accents to the opalescent glass were added using textured cathedral glass or glue-chipped plate glass. Ornamental glass was available in a great assortment of colors which were combined by the car builder’s artisans and craftsmen to blend with the car’s interior decor. Colorful small flowers were a popular feature of the clerestory transom windows. Car builders classified the upholstering the seats in the sleepers and observation as art work. The Oriental Limited featured different shades and patterns of plush upholstery and carpets used on the sleeper section seat frames, drawing room and compartments. Heavy and costly silk fringes were very beautiful and also blended with the glass, upholstery, and carpets. Matching green leather covered the diner seats and the observation room’s overstuffed chairs. In furnishing the entire Oriental Limited, the colors of the carpets, plushes, woodwork, fringes, and ceilings, were selected and arranged with a view to their perfect harmony and artistic effects. In September 1905, shortly before launching the Oriental Limited, Great Northern acquired its first Pacifics. The six class H-1 Pacifics delivered 28,670 pounds tractive effort, and were quickly assigned to the Marias and Stevens Pass districts. In 1906, Atlantics, more Pacifics, and dual service Prairies were ordered for its two transcontinental trains; the Oriental Limited and Fast Mail. April witnessed another new wheel arrangement as ten class K-1 Atlantics joined the roster. With 73" drivers and 19,560 pounds tractive effort, they proved too light for heavy passenger service except on the most level districts. Concurrent with the Atlantics, GN acquired thirty-five class H-2 Pacifics and fifty dual service class J-1 prairies. Both the J-1 and H-2 classes sported 69" drivers and an identical 33,090 pounds tractive effort. Both shared many of the same details and a few of each class were fitted with a superheater as an experiment. 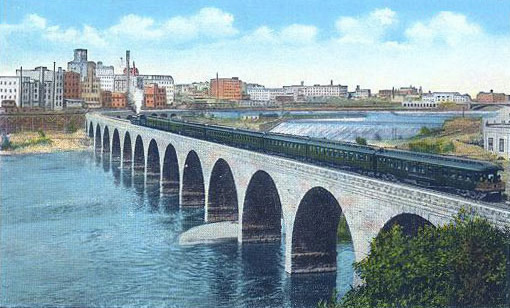 Normally, the Oriental, like the Flyer it displaced, carried eight cars the full distance between St. Paul and Seattle. The cars were arranged on the train in the following order: a 60' RPO car, a 68' baggage-express car, a smoking car, an 86 passenger day coach, a 14 section tourist sleeper, a 30 seat dining car, a 12-1 standard sleeper and the new compartment observation, which replaced the buffet-lounge car. Eight sets of equipment were required to protect the Oriental’s schedule; three traveling eastbound, three heading westbound and one at each terminal being serviced and readied for the return trip. 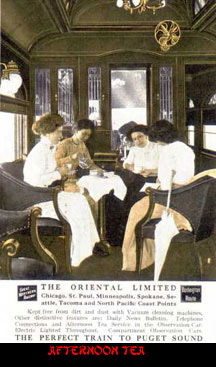 The Oriental’s lead car was the RPO followed by the Baggage & Express car. Both assigned types had clerestory roofs, closed ends, 6 wheel trucks, and gas lights. The eight 60' postal cars numbers 643-650 had been built by AC&F and had two doors on each side with five windows between the doors and a double window between each door and the end. The postal cars were unique on the Oriental in lacking the new arch window design. The double door 68' baggage & express cars numbers 572-590 were also AC&F products that were equipped with a desk for the messenger who rode with the car, a safe, a stove, coal bin, and hopper. The wooden floor had duckboards at one end know as fish racks on the Great Northern. GN listed second class coaches as smokers in its time tables. One was carried on the Oriental, normally as the first car behind the headend equipment. The smoker seated 71 passengers, was 68' long over the buffers, and had four wheel trucks. They were drawn from lot of 22 cars numbers 226-247, built for the new train by B&S in 1905 and 1906. The interior was paneled in birch and the seats covered in leather. 1905 B&S delivered 14 coaches for the Oriental Limited numbers 369-382. The cars seated 86 passengers, were 81' long over the buffers, and had six wheel trucks. The paneling, as with the Smoker and Tourist, was birch however the seats were fabric covered. In 1906 Pullman built 24 identical cars numbers 326-349. Nine 14 section tourist sleepers, numbered 829-837, were initially assigned to the Oriental . They were built in 1902 by B&S, outfitted with men’s and women’s restrooms, and equipped with a small cooking range and a coal heater. The sleepers were 68-feet long over the vestibules, did not have arch windows, and rode on four wheel trucks. The interior finish was more basic than found on the back end of the train. Paneling was birch and mahogany and leather upholstery. The window glass, upholstery and paneling colors were nevertheless coordinated to create a pleasing and restful effect. Diners featured expensive furnishings such as gilt mirrors, thick carpets, rich upholstery and draperies, hand carved English oak paneling and ornate light fixtures. The atmosphere of an English pub with overhead beams, green leather-covered chairs and a yellowish glass in the enclosed ‘cathedral globes’ light fixtures. Between the dining area and kitchen was the pantry that served as the waiter’s principal work area. A distinctive feature of the dining car was the sideboard or breakfront, which was placed at one end of the dining room between the pantry and the rest of the car. This handsome piece of cabinetry was a decorative focus and it served to screen off the working section of the car. China and silver plate were displayed behind its glass doors and a cut-glass vase of colorful fresh cut flowers was placed on it. Fresh cut flowers also brighten each table. Generally, only one sleeping car was assigned for the run between Seattle and St. Paul. It should be noted that GN also received three 16 section sleepers from Pullman in 1905. These were assigned to the Winnipeg Limited. In GN’s nomenclature of the period referred first-class sleepers as ‘Palace Sleepers’ and a drawing room was known as a ‘stateroom’, The Palace Sleepers assigned in 1905, were the 14 section, single stateroom cars numbered 944-952 built by Barney & Smith in 1902 for the Flyer. Their 80 foot design called for older style square windows, truss rods, and rode on six wheel trucks. All carried Washington State place names: Mt Index, Chelan, Olympic, Puget Sound, Washington, Everett, Stehekin, Okanagan and Mt Baker. In September 1906, Pullman delivered ten first-class sleepers of a newer design containing 12 sections, and a Stateroom. The longer 82-foot sleepers, numbered 957-966, matched the Oriental’s appearance with art glass crowned arch-windows. The sleepers interior featured plush upholstery and carpets surrounded by ornate imported dark reddish mahogany and vermillion woods. New 12- sleepers were named for on line towns; Tumwater, Similkameen, Lake McDonald, Grand Forks, Osakis, Alexandria, Whatcom, Cashmere, Espanola, and Mukilteo. Late in the next year and in early 1908, Barney & Smith delivered twelve virtually identical cars named Chopaka, Keremeos, Tumwater (to replace the first Tumwater destroyed in a 1907 wreck), Wamduska, Wayzana, Tulameem, Teton, Waneta, Osoyoos, Floodwood, Bellingham, and Vancouver. Sleepers carrying Oriental place names began arriving in 1909. 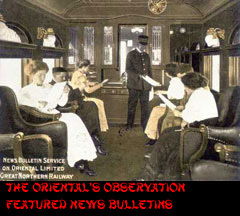 The Oriental Limited introduced the observation car to Great Northern’s transcontinental service, replacing the buffet-lounge car which had been the signature car of the Flyer. Pullman built eleven 80 foot observations in September, 1905 for the Oriental and Winnipeg Limited’s, numbers 760-770. Observation cars, like the diners, were not named. The designation ‘Compartment Observation Car’ was centered on the side below the windows, and the car number was painted on the side at each end. Each observation contained a drawing room, four compartments, a card room, a small buffet, a 15 seat observation room, and an open platform area. The observations were ornately decorated, featuring five different shades and patterns of plush upholstery, and as many different shades and patterns of carpets for the drawing room and compartments, with a sixth pattern for the lounge, card room and passageway. The Railway and Engineering Review article, cited above, provided a description of the interior. “The observation buffet library compartment cars will be the first of their kind to be used in transcontinental traffic and have been given particular attention. The ceiling in each compartment was painted in a soft pastel hues of rose, green, olive or pale orange, resulting in a harmonious color scheme with the wood work, upholstery fabric and carpets. The buffet, called a kitchen, served drinks and snacks from its closet-like kitchen and bar. The card room was finished like an English Club. The observation lounge was a featured large windows and comfortable leather cars. The observation platform was another attraction that by 1905 had became an expected part of the name train’s consist. The polished brass railings, drum sign, and scalloped, red and white striped canopy awning provided an enticing spot for those willing to brave the dust, cinders, and wind. On the glistening brass railing hung an oil illuminated drumhead, also a first for Great Northern. With the Oriental, the GN had a train to match the NP’s North Coast Limited in style and features and a schedule four and one half hours faster. Both trains usually consisted of eight cars built by the same companies, Pullman, B&S and AC&F. 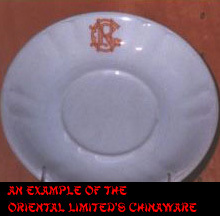 The Oriental Limited’s dining cars and the cuisine got special attention. Meal were on a par with best city hotels and better than available at most smaller towns. 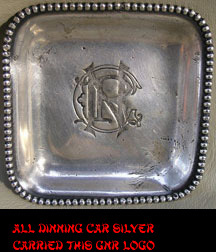 Passengers sat down to surroundings of cut flowers, sparkling white linens, and shining polished silverware. The printed menus were artistic and colorful. Game in the form of quail, antelope, venison, bear meat, and buffalo characterized the early Great Northern menus. The chefs of the Great Northern were celebrated for their knowing ways with sage hen, Rocky Mountain trout and mountain sheep. As the Oriental Limited begun, availability of game was beginning to disappear and regulations governing its sale and transportation began curbing its service in public restaurants including railway dining cars. The nature of the area served influenced the introduction into the diner menus of such territory products items as poultry, butter and vegetables from Minnesota, grains and pork from Dakota, beef and lamb from Montana and apples, clams, and salmon from Washington. Prices were kept low but food and service were kept high in quality. Initially, all service was ala carte, where the diner only paid for what was ordered. Later, Great Northern advertised meal were available a la carte, or table d’hote. Excellent table d’hote dinners included all the trimmings, soup and dessert, hot breads, olives, nuts, preservatives, mounds of vegetables and water ices with the meat course, pickles, chow chow, and the elaborate and spectacular salads dear to the heart of the vegetable chef. Advertising continued to stress ala carte meals were available for the budget minded. The dining car china was heavy and serviceable, with the ‘Hill’ pattern in use when the Oriental began. The service pieces were white and pattern consisted of the letters G.N.R. intertwined into logo. The three individual letters were orange, outlined in dark brown. ‘Hill’ was the third pattern used by Great Northern. The first was known as the ‘Manitoba’ pattern and consisted of the words Great Northern Railway on the rim. The second was the ‘Montana’ pattern, which was very similar to the ‘Hill’ pattern, except only the initials G.N. were intertwined. Flatware, as well as such arcane service items as cheese scoops, crumb knives, oyster folks, and sugar tongs, all carried the ‘Hill’ design. Covered soup tureens, fruit-cocktail bowls, bread trays, butter dishes, gravy boats, coffee servers, sugar and creamers, glass vinegar cruets, ice cream dishes, and bon bon dishes all added glamour to the white cloth-covered table. For first class passengers the observation car provided a break from the monotony of the prairies. The observation lounge was a center of activity with a library, a magazine rack, and a writing table. In keeping with the Oriental theme, a card game, adapted from an oriental game called Mah Jongg, was available to passengers as well as cards and bridge score pads. Great Northern’s tourist stamps, post cards and postage stamps were available from the porter who also provided cigars, candy, beverages and snacks from the buffet. The buffet, called a kitchen, served drinks and snacks from its closet-like kitchen and bar. The buffet performed an important on-train food service, where the need for a small snack such as a cup of coffee or tea, a sandwich, or some bouillon might “relieve the faintness” between meal. The Oriental’s diner’s menu was too heavy for such needs, and the dinner was closed during off-hours. Every afternoon at four, tea was served in the lounge by a waiter from the diner. Close behind followed another with a platter of dainty cakes. News and market reports telegraphed to stations and placed on board in observation lounge, several times a day. The card room featured a round green leather booth surrounding the table. The rich English oak finish provided an atmosphere like an English Club. Conductors and porters were issued small cards warning of card sharks. The cards were discretely passed to passengers when appropriate. The observation car platform offered the best view on the train. The panorama of the passing countryside was uninterrupted by window posts or curtains. There was something exciting about the ride as well -- the clatter and roar, the swirling wind and dust, and the hypnotic sight of the tracks as they disappeared into subtle triangle at the far horizon. 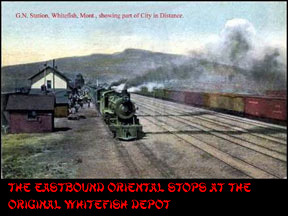 As the train passed through the small towns of Eastern Washington and Montana, passengers could stand on the rear platform to be eyed by ranch-bound locals who wished that they too were aboard the glamorous Oriental Limited’s observation car flying toward the attractions in the more populated terminals. The reference sheet will provide a fuller description of the train as well as information on the 1909, 1914 and 1922 equipment and schedules. The reference sheet contain the usual array black and white photos and drawings. These color images will not be included. Chooch's Ultra Scale II line recently released an exqusite series of kits to build the 1905 Oriental Limited in O Scale. Check for availability. Modelers in the minor scales are on thier own!